Dalton John Richter, 79, Bismarck, left his earthly home to enter into eternal rest with his Lord and Savior on Feb. 21, 2013, at Sanford Health, Bismarck. A celebration of his life will be held at 10:30 a.m. Tuesday, Feb. 26, Shepherd of the Valley Lutheran Church, Bismarck, with the Rev. Lester Wolfgram officiating. Burial will be at the North Dakota Veterans Cemetery, Mandan. Visitation is scheduled from 5 to 7 p.m. Monday at DaWise-Perry Funeral Services, Mandan. Visitation continues one hour prior to the service at the church. Dalton was born April 26, 1933, in Bismarck, to John and Fredericka (Stiefel) Richter. He lived his earlier years on the family farm 14 miles northeast of Hazen, the youngest of seven children. He moved to Hazen with his parents in 1945, and graduated from Hazen High School in 1951. Dalton worked as an apprentice electrician at the Garrison Dam during its construction in 1952. He also served in the U.S. Army during the Korean War from 1953 to 1955, receiving an honorable discharge with the rank of Sergeant. He attended Coyne Electrical School in Chicago and went on to work for Ray’s Refrigeration in Hazen. On June 21, 1957, Dalton was united in marriage to Luella (Weigum). During their union Dalton and Luella had two children, Michael and LaDon Richter. Dalton worked for Kincaid Truax-Traer Coal Mine in Columbus. He went on to own and operate Richter’s Refrigeration, before returning to Truax-Traer when the consolidated coal mine was started near Stanton. He worked in electrical maintenance until 1968, when he went to work for United Power Association. He held a position in electrical maintenance until 1977, when he was promoted to electrical and instrument supervisor, where he remained until his retirement in June 1993. Upon retiring, Dalton and Luella spent their summers at home in Hazen and enjoyed their winters in Yuma, Ariz. In 2003, they built their home in Bismarck, where he currently resided. Dalton loved sports, especially baseball and the Minnesota Twins, football, and boxing. In his earlier years, he boxed as an amateur Golden Glove, played amateur baseball with local teams, and managed the Hazen Babe Ruth baseball team for two years in the 1970s. 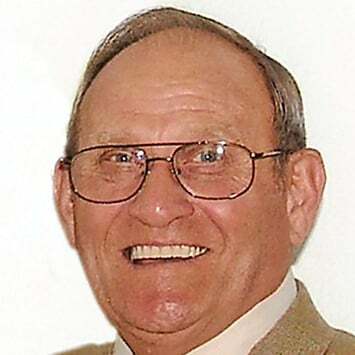 Dalton was a member of the Hazen Lions Club for 10 years – holding the position of President for three years – and was a member of the Board of Directors for six years. While residing in Hazen, he was a member of St. Matthew Lutheran Church, where he served as elder, treasurer, trustee, steward, and head usher. Dalton lived for music. He was a very gifted accordionist who loved to play old-time music and entertain with perfection. Most recently, he was a proud member of the Hungry Five who would travel to nursing homes, etc. to entertain the elderly. He truly treasured his musical years during the 70s when his son, Michael, who he admired as an accomplished drummer, was a member of his band. He taught accordion for several years and organized the Hazen Oompa Band, of which he was a member for five and a half years. Dalton is survived by his wife of 55 years, Luella (Weigum) Richter; his son, Michael (Mary) Richter, Hazen; his daughter, LaDon (Kent) Buchholz, Lincoln; five grandchildren, Erica and Devin Richter, Amanda, Kaleena, and LeAndra Buchholz; and his beloved feline friend, Mieshu. Dalton was preceded in death by his parents; his brothers, Edmund, Wilmer, and Orville; and his sisters, Hulda, Lillian, and Adina. Please sign Dalton’s guest book and share memories at www.dawiseperry.com.